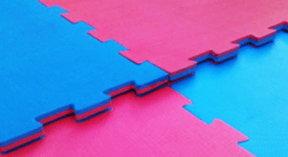 At Ezy Mats, we specialise in good quality and easy to use jigsaw mats. Our products are designed in such a way that you can easily carry them to your gym location and install them quickly. While you can call professionals to install if you want to save some time and effort, DIY installation is certainly possible and you’ll only need a few hours to complete it, based on the size of your gym. We recommend our jigsaw mats for exercise rooms, martial arts training rooms, as well as kid’s play or entertainment rooms. Here are some things you need to know before you purchase jigsaw mats. Before you place your order for the mats, measure the floor space you want to cover carefully. You need to ignore all of the installations and equipment present on the floor and measure from wall to wall. This would ensure you have enough material to cover the entire floor without any gaps. It’s also a good idea to have some room for error; so always purchase 15% to 20% more than you need. Gym mats are quite useful and you can store the spares to replace any that get damaged in the future. Jigsaw mats are very flexible and are designs to adjust to the environment. Their shape and structure would alter marginally once you install them so it’s a good idea to bring them to your property and let them sit for a while to acclimate to the environment. It would allow the jigsaw mat pieces to grow and truly lock with each other, which would create a solid and unmovable floor. This insures people can move, exercise, perform martial arts and gymnastics on a steady and secure floor. Before you install the pieces, make sure the floor surface is even and there are no dents and cracks on the surface. Damaged flooring will damage your mats and shorten their lifespan eventually. Moreover, our thick jigsaw mats will cover any dents so you won’t notice a problem until someone has an accident. You should also make sure that the floor is even because uneven floors will cause the jigsaw mats to dip and slide around, which can cause accidents. You can add an underlayment or level the floor before you install the mats. The jigsaw mats are designed to lock into place with each other. You should not apply glue to the base to attach them to the floor. The glue will not only damage the mats, but it will also compromise their flexibility and harden them. These mats need to stretch and flex in order to provide enough support.